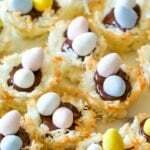 You're gonna love these Coconut Macaroon Nests that are filled with dark chocolate and topped with Mini Cadbury Eggs because they are the perfect Easter treat! In a bowl, stir together whites and salt with a fork; mix in coconut. Using your medium scoop, place mixture into each prepared tin. Lightly press mixture into bottom and up sides of each cup. Melt 1/2 bag of dark chocolate chips and stir well.